Enjoy! If you liked this article you can digg it. I found out that this method actually works on most sites with video content. Simply load up the page with the video object and look for the biggest file in the ‘Net’ tab in Firebug (it’s usually several megabytes in size). Then use wget to get the file, but do remember to put quotes (“) around the file because some of the characters in the filename (such as ampersands) might give weird behaviour in a terminal. This method even works on sites that have ‘pre-rolls’ or advertisements. 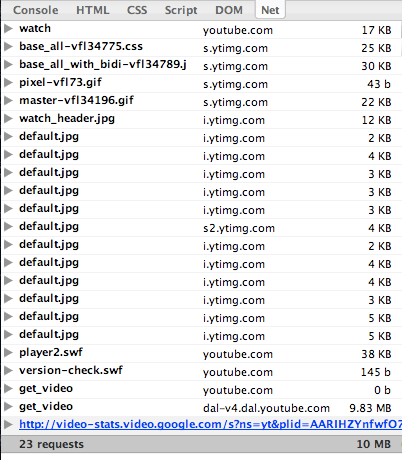 Simply wait until the pre-roll is over and a new large file will appear in the ‘Net’ tab. This is the movie file you need! And if you want to view the downloaded file (usually a Flash video or ‘flv’ file) on your iPod, iPhone or PSP you can use the excellent Handbrake to convert to those formats. It is a free online tool so you don’t have to install any software. On the site you can find also a step-by-step guide and a video tutorial. If the video have been uploaded in high quality you can download it also in mp4 format (you can use this on ipod). You don’t need to use a download manager. 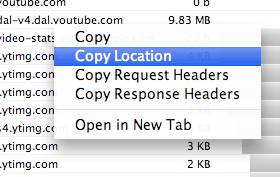 In step 4, just click on “Open in New Tab” instead, and you’ll be prompted to save the file directly to your PC.